Wang Qishan (Chinese: 王岐山; pinyin: Wáng Qíshān; born July 1948 in Qingdao, Shandong) is a politician in the People’s Republic of China who currently serves as the Vice-Premier in charge of economic, energy and financial affairs under premier Wen Jiabao. Previously Wang served in regional positions in Hainan and Beijing. He was elected to the 17th Politburo of the Communist Party of China, became a member 17th CPC Central Committee and was elected Vice-Premier in March 2008. Wang is speculated to be a core figure in the upcoming fifth generation of CPC leadership. 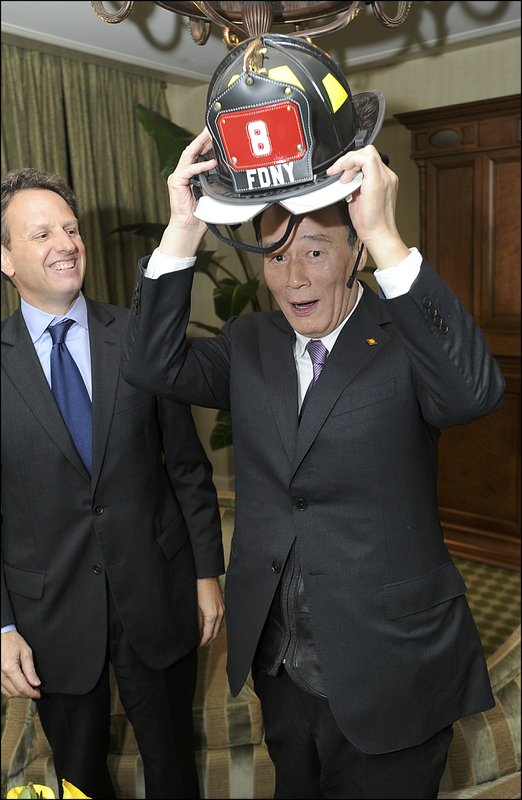 "Firefighter" During their working dinner Tuesday night, Secretary Geithner presented Chinese Vice Premier Wang Qishan with an authentic New York City Fire Department hat – a reference to the “firefighter” nickname that the Vice Premier earned in China for being the “go-to guy” for handling tough issues like SARs, the Olympics, and Guangdong’s mid-1990s banking crisis. US Treasury photo taken January 18, 2011. 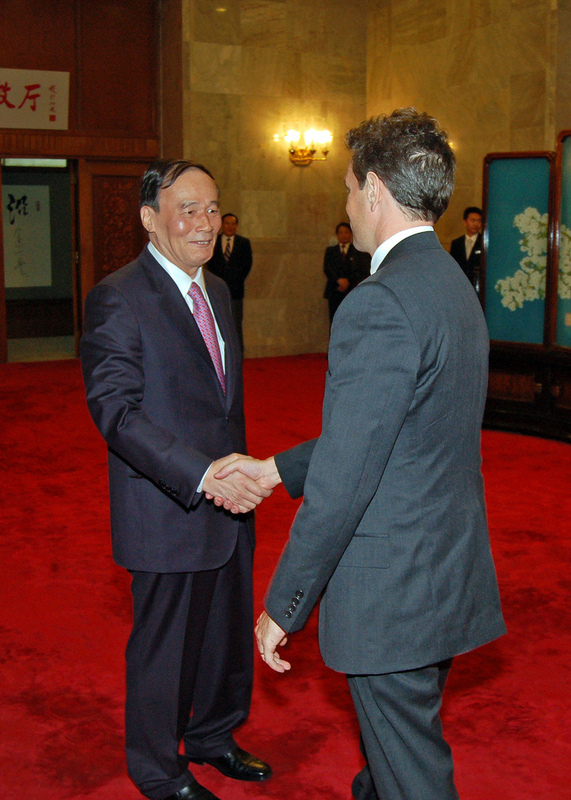 Geithner-Wang Qishan Meeting On October 24, 2010, U.S. Treasury Secretary Timothy Geithner, President Barack Obama’s special representative, met with Vice Premier Wang Qishan of the State Council and special representative of Chinese President Hu Jintao at the airport in Qingdao, China. 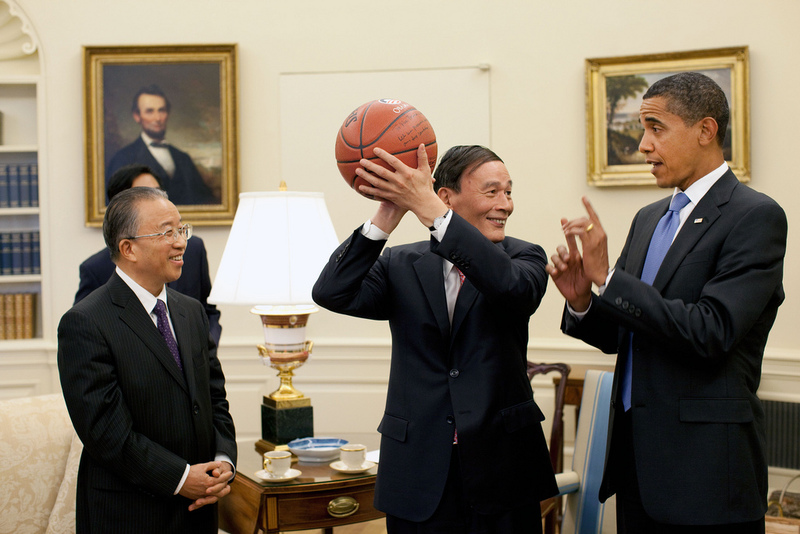 The two sides exchanged views on U.S.-China economic relations and the preparation for the Leaders’ Summit in Seoul. 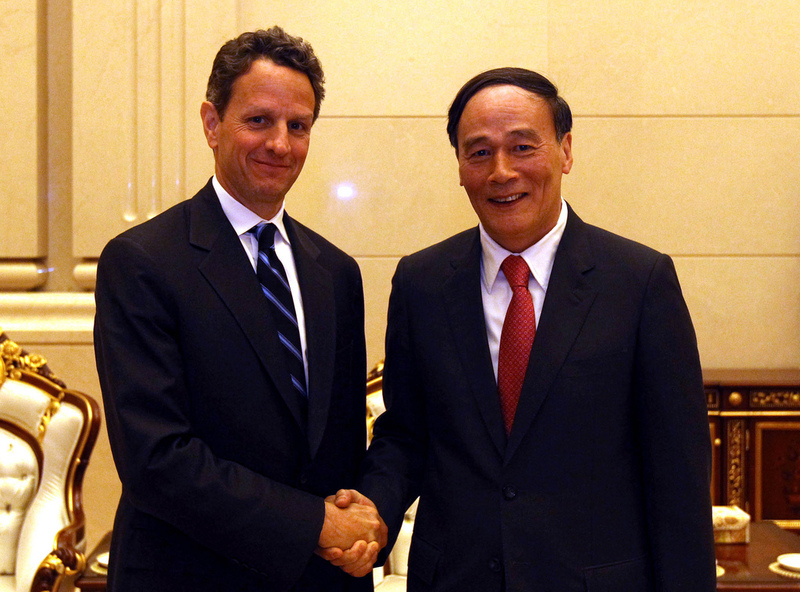 China trip: May 31-July 2 2009 Secretary Geithner meeting Vice Premier Wang Qishan, his counterpart in the U.S.-China Strategic and Economic Dialogue, at the Great Hall of the People. 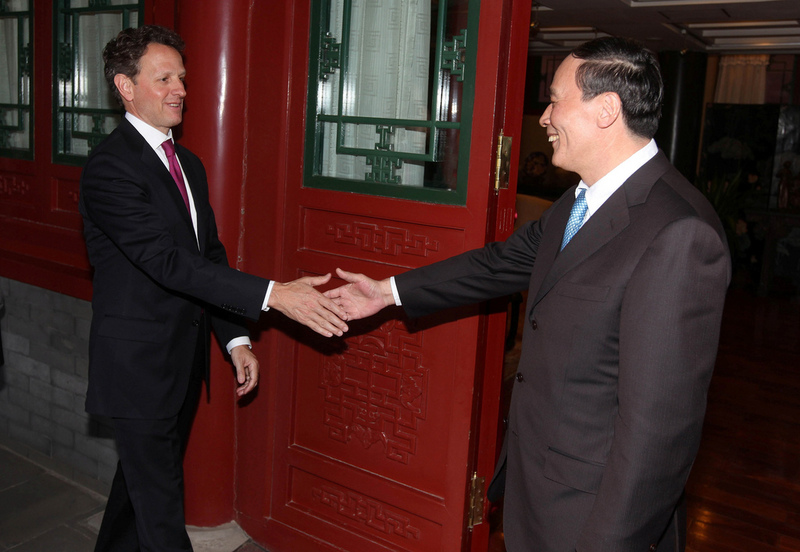 S&ED, 5/23/10 Secretary Geithner greets Vice Premier Wang Qishan before their working dinner Sunday in Beijing. 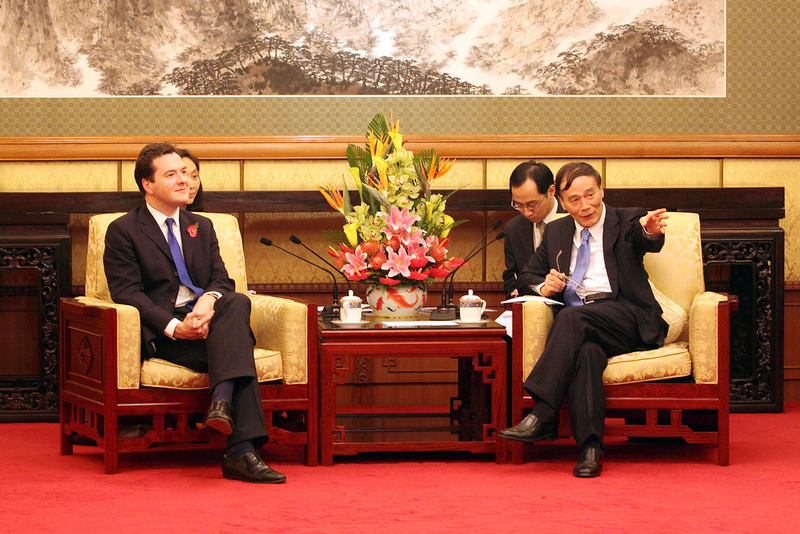 George Osborne meets China Vice Premier Wang Qishan. 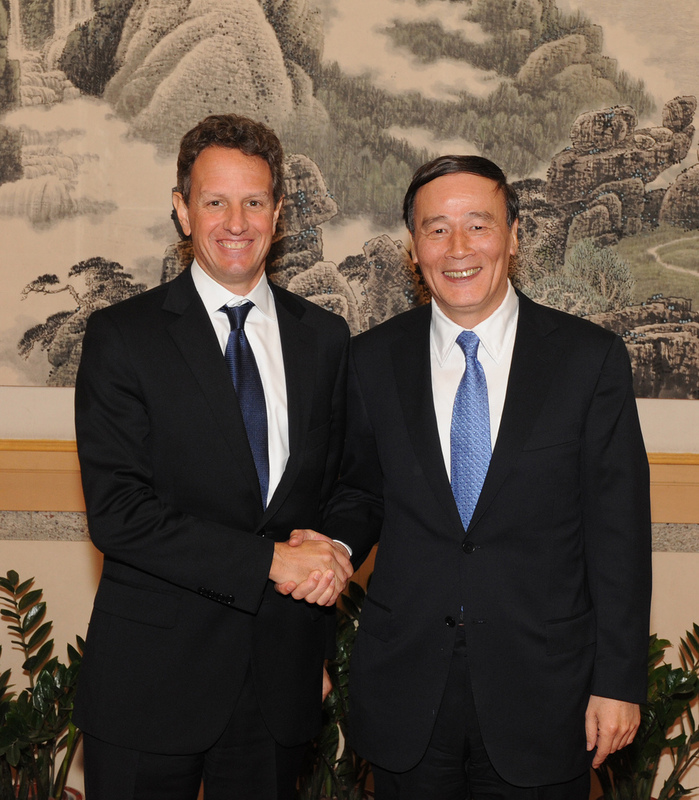 Chancellor George Osborne meets China Vice Premier Wang Qishan. Interpreters seated behind. 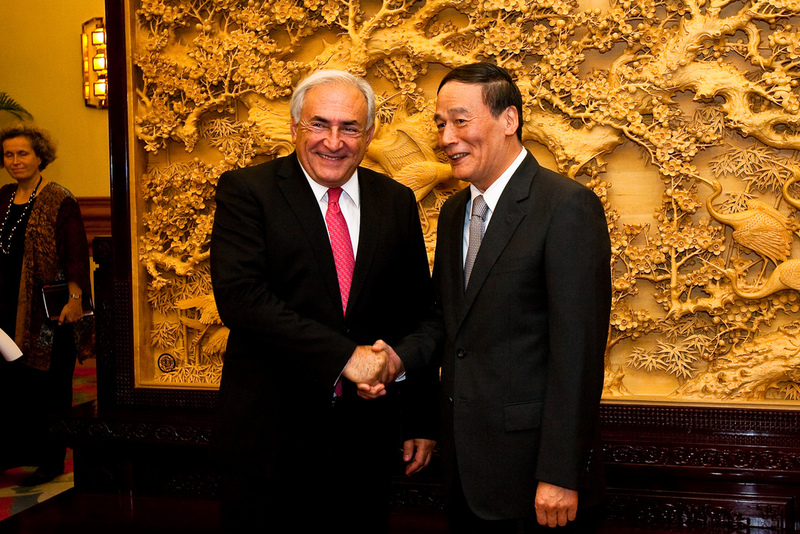 2010 October China Visit International Monetary Fund's Managing Director Dominique Strauss-Kahn and China's Vice Premier Wang Qishan. 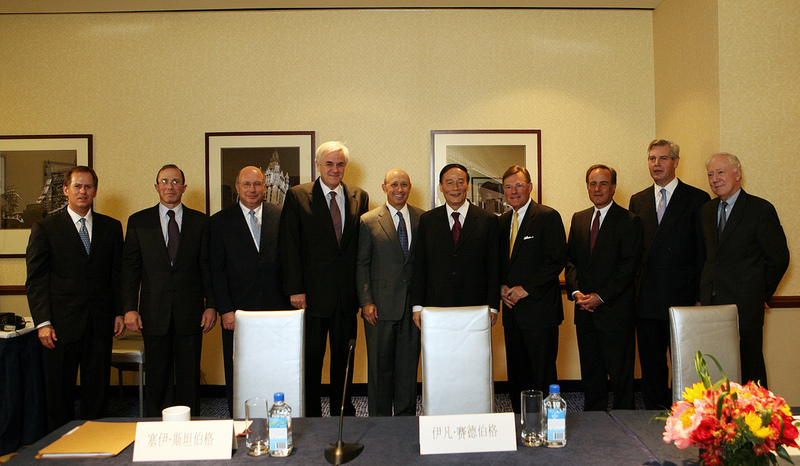 Business Roundtable Meets with China's Vice Premier Wang Qishan Harold McGraw III, chairman, president and CEO, The McGraw-Hill Companies, and chairman of Business Roundtable along with seven other Business Roundtable member CEOs met with China's new Vice Premier Wang Qishan to discuss the state of the U.S. and Chinese economies and opportunities to increase cooperation and dialogue among U.S. and Chinese business leaders. From left Mr. Stephen A. Odland, chairman & CEO, Office Depot; Mr. Evan Greenberg, chairman & CEO, ACE Limited; Mr. Sy Sternberg, chairman & CEO, New York Life Insurance Company; Mr. Norman R. Sorensen, president & CEO, Principal International, Inc.; Mr. Lloyd C. Blankfein, chairman & CEO, The Goldman Sachs Group, Inc.; Vice Premier Wang Qishan, People's Republic of China; Mr. Harold McGraw III, chairman, president and CEO, The McGraw-Hill Companies; Mr. Ivan G. Seidenberg, chairman & CEO, Verizon Communications; Mr. John J. Castellani, president, Business Roundtable; Sir Andrew Crockett, chairman, JPMorgan International. Business Roundtable meets with China’s Vice Premier Wang Qishan on June 20th in New York to discuss the state of the U.S. and Chinese economies. 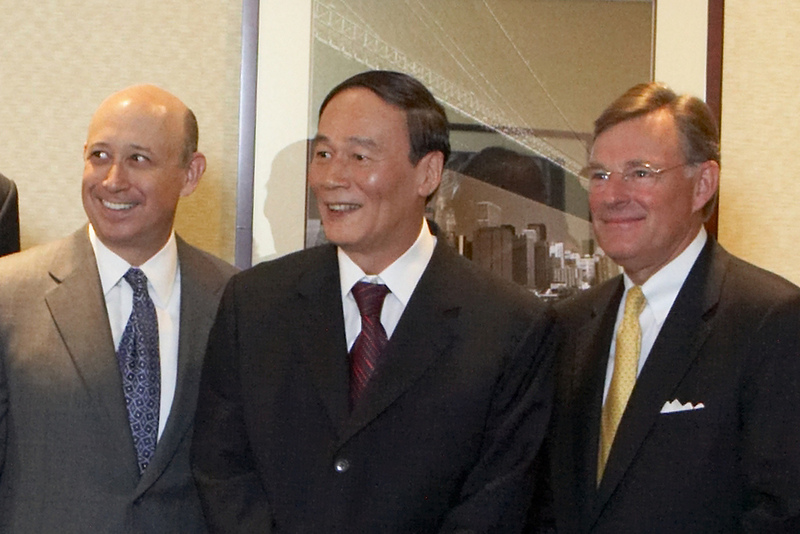 From left: Mr. Lloyd C. Blankfein, chairman & CEO, The Goldman Sachs Group, Inc.; Vice Premier Wang Qishan, People’s Republic of China; Mr. Harold McGraw III, chairman, president and CEO, The McGraw-Hill Companies. Business Roundtable meets with China’s Vice Premier Wang Qishan on June 20th in New York to discuss the state of the U.S. and Chinese economies. 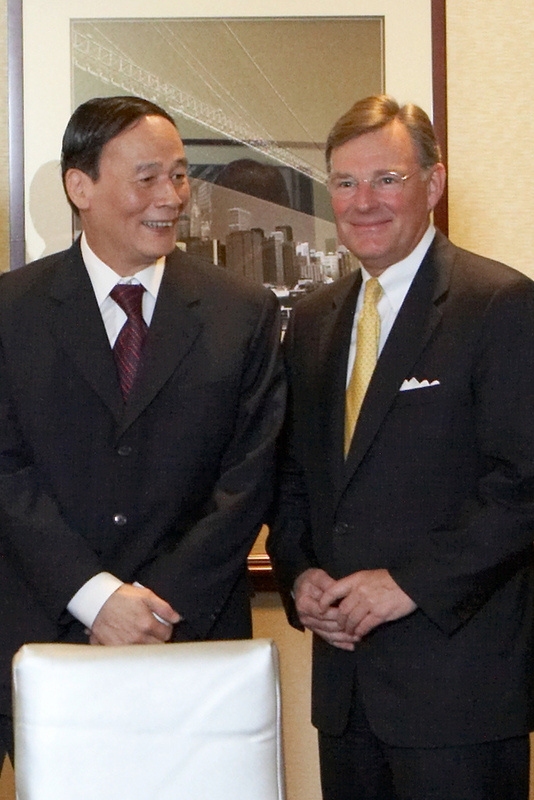 From left: Vice Premier Wang Qishan, People’s Republic of China; Mr. Harold McGraw III, chairman, president and CEO, The McGraw-Hill Companies. Business Roundtable meets with China’s Vice Premier Wang Qishan on June 20th in New York to discuss the state of the U.S. and Chinese economies.